Here I was thinking to myself as I walked out into the public for the first time wearing my oxygen. I was scared. I was a nervous wreck and I thought my life of carefree fun was over. I knew all the right things to tell myself. “Who cares what other people think? You don’t know these people and they don’t know you. So why do you care what they think about you wearing oxygen? So, what. Right?” But I did care. I’m human. People do stare. It’s human nature to be curious. When I catch them staring, I just smile at them and it throws them off. I guess people don’t expect me to be so… I don’t know.. Friendly? Outgoing? or Willing to talk about “What’s wrong with me.” However, a smile works every time. You see, there’s nothing wrong with needing to use oxygen. It’s just your body telling you that it needs a little extra help. With that help of oxygen, you might just find that you can do more, be more active and live longer. I was also very nervous about being seen in public with my oxygen the first time. It’s all about your attitude, as you know. If I feel comfortable with it, so do others. 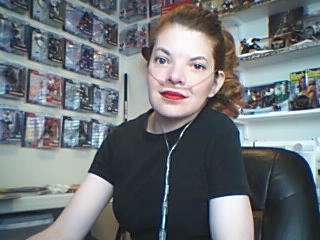 I often get questions from family members of oxygen users wanting to know about my equipment and the different options. I also get comments from people who tell me they’re supposed to be using O2, but are too embarressed. I think it helps them to see me out there and managing just fine. You’re right Cindy. It’s all about internal attitude. I do worry about those people who are SUPPOSE to wear oxygen yet do NOT because they are embarrassed. They are only hurting themselves by not using oxygen. I only hope that when they see us walking around with our oxygen on and having a great time, they’ll change their minds about using their oxygen.